Home > Home Schooling > Is Home Schooling right for your Child? We have already looked at what constitutes Home Schooling and what you – as a parent – are reasonably expected to do in order to provide your child with an education at home, which mirrors that which they would expect to receive in a state school. You might also want to consider if home schooling is something that your child will (a) benefit from and (b) want to undertake with the level of enthusiasm that he or she would have for being educated in an environment with other children. Why do I want to home educate my child? Is it for my personal reasons or because I truly believe it's best for my child? Will my child benefit from not being educated alongside other children? Children have varying needs and degrees of learning that differ from other children so in considering this - will keeping my child at home add to their ability to learn or detract from it? Many might argue that educating their children at home offers them the chance to interact more with them and offer them an insight into the world as a whole that a school education would not. What kinds of opportunites can I provide my child with, that will enable their social interaction with a wider peer group? Children have varying attention spans - will your child benefit from being in an environment which is not perhaps as disciplined as the school environment? Will my child experience the competitive element that spurs some children to work harder or approach a challenge? The home environment holds many distractions, television, video games, computers etc, which an education within a state school would not. Will your child respect your authority enough to avoid these distractions? Each child is different - for some Home Schooling will provide an effective and stimulating means of learning. Recent studies have shown that the number of parents educating their children at home has increased substantially and equally, studies have also shown that the number of children being educated at home who have then moved into full-time state education has increased also. In some instances this is simply because it is not right for the child but in other instances it is because the parent – or parents – cannot afford the time and financial resources required to sustain an acceptable level of education. 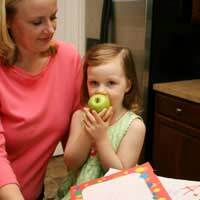 Before entering into a course of homeschooling it is worth not only considering whether you – as a parent – can give the time and enthusiasm required to teach your child – but also whether or not your child will flourish or wither as a result of it. Before entering into it discuss it with your child or children, and also discuss it with your Local Education Authority, they will offer your advice and guidance, but should not try to dissuade you in any way. My son has dyspraxia, I wish to flexi school him, take him out of school on a Monday, as he clashes badly with the stand in teacher.She makes him feel ashamed of his work (his words) the headmaster has said no, does it all end there, or can I fight it please?